Are you struggling to write an article, a business letter, a legal document, an academic paper, or a scientific or medical report? Are you having trouble remembering the endless rules of grammar – when to use a semicolon instead of a dash or whether you should capitalize the first word after a colon or leave it lowercase? Has it been years, or even decades, since you took an English composition class and feel that there is just no way you could compose an error-free resume, cover letter, or even personal email? If you answered "yes" to any of the above questions, then consider yourself perfectly normal – few people today outside the world of academia have a strong handle on the mechanics and rules of grammar. That's why it's not uncommon for you to pick up a business proposal or read through a legal contract and find it riddled with grammatical and punctuation errors. But even though such errors have become commonplace, that doesn't mean that you should feel comfortable sending off your writing loaded with mistakes. A potential employer or a potential client will still likely notice those errors and it will reflect poorly on you. It should go without saying that this is also true for students applying to university or graduate school. Investing in WhiteSmoke's online grammar check software (either our free grammar software or our paid grammar check software) is a guaranteed way to make sure that you never submit a grammar-filled piece of writing ever again. 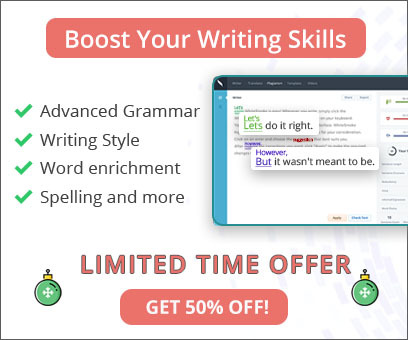 Our online grammar checking software will find your grammatical mistakes and fix them, ensuring that your final product is free of grammar errors that could taint your image. Instead of submitting a poorly written resume, for example, you'll hand your future employer a document that you can truly be proud of, one that represents you at your very best. A sloppy resume filled with careless grammatical mistakes will give off the impression that you're a sloppy, careless person; a well-written, flawless document will achieve the exact opposite result, and will likely land you that highly sought-after position. Although MS Word has a grammar check program, it does not always catch the little mistakes (and sometimes not even the larger, obvious errors). One reason why WhiteSmoke's online grammar check program is reputed to be a cut above the rest is because of its use of built-in algorithms that compare your writing against hundreds of thousands of samples. This helps the program quickly identify every single mistake and not only correct it, but inform the writer of the mistake so that he or she can learn how to avoid making that grammatical or syntax mistake again in the future. And not only that – but you as an individual will become more confident with your writing skills when you use WhiteSmoke's grammar checker. Whether or not English is your native language, there are always grammatical rules that you could benefit from reviewing. 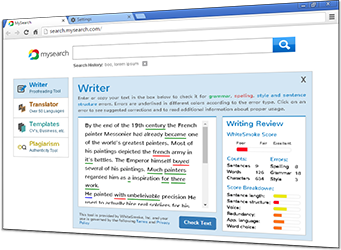 Our grammar checking software won't just correct your important formal and informal documents, but will educate you as to what impressive writing looks like and the ways in which you can achieve your writing goals.